For the Jewish community, the close of summer and start of fall represents a time for celebration and deep contemplation. Sundown on Sept. 9 marks Rosh Hashana, the start of the Jewish new year, and begins a High Holy Days period when Jews reflect on the past year, their faith and their community, culminating in Yom Kippur, or the Day of Atonement, at sundown on Sept. 18. The holidays in part harken back to the biblical story of when the Israelites, wandering through the wilderness and awaiting Moses’ return from Mount Sinai, turned to worshiping a golden calf statue, according to Baron. Angered by their idolatry, Moses left the Israelites again, but when he returned on the 10th day of the month, he found the community had repented. The tradition of reflecting on past failings on Yom Kippur was thus set forth. Wilshire Boulevard Temple will observe these High Holy Days with the first Rosh Hashana service starting at 4:30 p.m. on Sunday, Sept. 9. On Sept. 10, the temple offers six services throughout the day, with the first starting at 8:45 a.m., as well as options catered for different age groups, such as a service for nursery-age children, one for students in grades K-2, and another for children in third grade and above. The Wilshire Boulevard Temple will also have the traditional shofar horn blowing and fountains running in its courtyard on the Monday of Rosh Hashana so people can perform the tashlich ritual, or a symbolic washing away of sins, Leder said. The Beverly Hills Temple of the Arts’ Rosh Hashana service, on Sept. 9 at 8 p.m. and Sept. 10 at 10 a.m., will feature music by Broadway composer Richard Kagan and readings by actress Julie Hagerty, of “Airplane!” and “She’s the Man.” The High Holy Days services will also feature special appearances by Ryan Deitsch, a survivor of the 2018 Marjory Stoneman Douglas High School shooting in Parkland, Florida, and a Los Angeles Police Department officer who was present at the 2017 Las Vegas shooting, in conjunction with Baron’s sermon on the interplay of fragility and resilience. 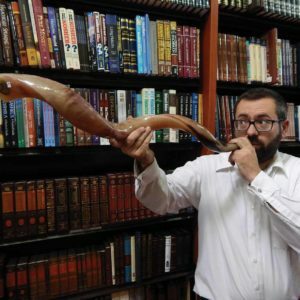 For those unable to make it to a temple on Rosh Hashana, the Village Synagogue will host “Shofar in the Park” at Pan Pacific Park on Sept. 10 from 5:45-6 p.m. The free event will feature paleo honey cake, small plates of apple and honey, and pomegranate juice, along with blasts of the shofar horn to usher in the new year. Similarly, Yom Kippur at the Beverly Hills Temple of the Arts will include a service at 8 p.m. on Sept. 18 and then an all-day ceremony on Sept. 19, starting at 10 a.m. The day will feature mediations, movie screenings and a discussion with four World War II veterans who participated in the Normandy invasion. Actor George Takei, of “Star Trek,” will also deliver a reading by Albert Einstein on the shared human condition, and discuss being sent to the Japanese-American internment camps during World War II and the story of Chiune Sugihara, the Japanese diplomat who helped several thousand Jews flee from Europe during the Holocaust.